Fleas are little parasitic critters that survive on their hosts’ blood. Fleas can use a large number of birds and mammals as hosts. Flea bites on humans (Pulicosis) itch, can swell up, and are definitely not pretty. 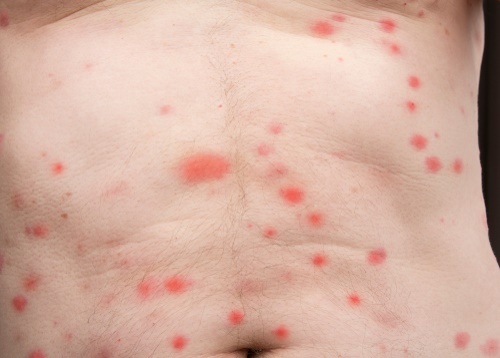 The majority of folks, as well as animals, have an allergic reaction to flea bites. This is because they are allergic to the saliva of fleas. On top of that, fleas can transmit several serious diseases and other parasites. If you are worried you might have fleas inside your home, you might want to get familiar with how to identify flea bites, as well as how to treat them. Fleas are very small animals and, for that reason, flea bites don’t usually cause much pain. However, flea bites tend to itch. This itching can lead to the bitten person scratching the area. This scratching can, in turn, cause sores, scabs, and even infections. Those people who have an allergic reaction to flea bites may develop a rash one to three days after being bitten. Flea bites look like little mosquito bites. They have a lightly raised red area which may be somewhat swollen. In addition, they will have a small puncture mark in the middle that looks like a little dot. Common places to find flea bites are inside knees and elbows, armpits, neck, waist, and ankles. The bites will usually be in a group (cluster) in the same area. In serious cases in which someone has been bitten an extremely large amount by fleas, the host may contract anemia. On their own, flea bites aren’t usually dangerous. It is important to know, though, that fleas can carry and transmit parasites and diseases. These parasites and diseases can have much more serious repercussions than the flea bites on their own. There are tens of bacterial and viral diseases (and also parasites) that can be carried by fleas. In fact, it is thought that fleas were the original cause of the Bubonic Plague, transferring it from rodents to humans. Because of this, if you have flea bites and start to have a reaction beyond a moderate rash, it is important that you go seek that advice of a doctor. Make sure not to scratch flea bites. Scratching or itching a bite will only make it itchier and can cause wounds or scabs which in turn can cause an infection. Take a pill against allergies (antihistamine). This pill will stop your allergy to flea’s saliva. If you have an allergy, this will help to stop any swelling, hives, rashes, as well as any itch around the bites. Soak a washcloth in soapy water. Use the washcloth to scrub the bites and the areas around them. Doing this will remove any dirt or bacteria that is around the wound, reducing the chance of infection. If you have any calamine lotion or hydrocortisone handy (if not you can find some in a pharmacy), put it on the bites. This will drastically reduce itchiness. Use ice on the flea bites if they are swelling up. If before or after these treatments you see that you are developing symptoms beyond mild rashes and itching, you may need to see a doctor. I don’t even have a cat, my sister and my grand kids do. for some reasone they are biting the **** out of me, I have well over 100 bites, all around the ankles, waist, neck, chin, back. I CANNOT not itch. the problem is, I am prone to infections, I have a weakened immune system, from a genetic disease, I am worried these are going to become so severe, I will end up in the hospital again. I use partial white cedar vinegar with water to wash them, and I take Benadryl to stop the itching, but it barely helps. I am out of it right now anyway, Any other suggestions? Yes we are going to get the house and cat done as soon as we get paid, is there anything to be done now? Even if you don’t have any pets, fleas can be found in grass. That’s where pets get them from.